The world's biggest video game publisher doesn't take allegations of "Orwellian" investigations and unfair dismissals in silence. Activision has responded to the lawsuit filed by Jason West and Vince Zampella, the ousted former heads of Modern Warfare 2-maker Infinity Ward. "Activision is disappointed that Mr. Zampella and Mr. West have chosen to file a lawsuit, and believes their claims are meritless," the company said in a statement e-mailed to Kotaku by a spokesperson. "Over eight years, Activision shareholders provided these executives with the capital they needed to start Infinity Ward, as well as the financial support, resources and creative independence that helped them flourish and achieve enormous professional success and personal wealth. "In return, Activision legitimately expected them to honor their obligations to Activision, just like any other executives who hold positions of trust in the company. While the company showed enormous patience, it firmly believes that its decision was justified based on their course of conduct and actions. Activision remains committed to the Call of Duty franchise, which it owns, and will continue to produce exciting and innovative games for its millions of fans." West and Zampella, who were fired by Activision from the company's Infinity Ward studio on Monday for as-yet undisclosed "insubordination," are seeking in excess of $36 million. G4, which broke the news of the brewing trouble at Activision, reported today that Activision is seeking documents regarding West and Zampella's communications with other companies, including Activision rival Electronic Arts. 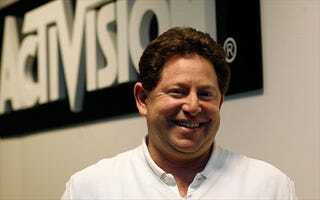 As recently as last month, Activision CEO Bobby Kotick (pictured above) made it clear there was no love lost between his company and EA. Read the full Zampella/West lawsuit against Activision.